A free open source alternative to Microsoft Project. Allows you to connect to a database for central management. Open Workbench (www.openworkbench.org) can be used and distributed free of charge. It is a stand-alone desktop application that provides robust project scheduling functionality. Thus it requires installation. 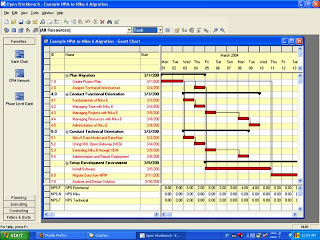 Open Workbench provides the unique ability to generate project schedules based on resource constraints. It can also be used in a fully integrated fashion with CA's Clarity solution. This tool is good for project managers but a new user would require some form of training to fully appreciate the product.